Recently, growth in the nuclear industry has been fuelled by the necessity of nations worldwide to overcome dependency on fossil fuels. This growth is expected to increase in coming years (World Nuclear Association, 2017), and with it, the production of nuclear waste in the forms of spent fuel rods, radioactive wastewater and reactor components, among others. This issue is expected to become more difficult to overhaul , and so will require new and innovative techniques to tackle it. Furthermore, there is an urgent need for heavy water in the nuclear industry, which is expensive and difficult to produce. New research into the applications of graphene offers many opportunities to deal with these issues. Research by a group at the University of Manchester National Graphene Institute has found the possibility of applying graphene to the nuclear industry. Heavy water is a necessary component in the generation of electricity using nuclear power. However, it only occurs in low concentrations in nature. Extraction of heavy water to the levels necessary for energy production is a highly complicated and energy demanding process. 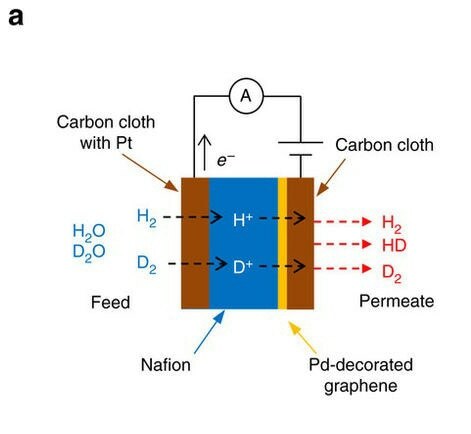 It has been found that micron-scale graphene crystals can be used to sieve hydrogen nuclei (Achtyl, et al., 2015), enabling the separation of hydrogen nuclei from deuterium nuclei and thereby allowing the production of deuterium for heavy water. The group synthesized the graphene and placed it on Nafion, an ionic polymer, to use it as a permeable membrane. They then set the graphene-Nafion membranes in a feed and permeate chamber with a large volume of heavy water, and normal water vapor-gas mixtures added, to form an electrochemical pump as shown in figure 1. By applying a voltage bias across the device, they could filter and pump the hydrogen and deuterium atoms. 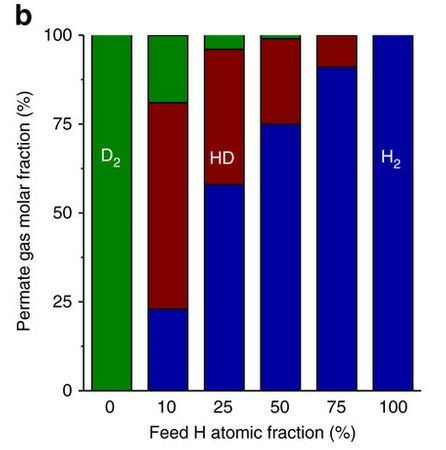 They then subsequently measured the amount of deuterium and hydrogen in the permeate and found that significant amounts of deuterium were filtered out, as shown in figure 2. The group found significant potential filtration capabilities and the possibility of applying this to the generation of heavy water. Furthermore, at the energy demands used in the experiment, they found that they could outperform the efficiencies of the Girdler-Sulfide and monothermal ammonia-hydrogen processes by a factor greater than 30%, allowing for greater and more efficient production of heavy water at lower energetic costs than ever before. Researchers at the Institute of Nuclear Physics and Chemistry, part of the China Academy of Engineering Physics, have also found a possible method of applying graphene to the removal of uranium ions from aqueous solution (He, et al., 2018). This method was motivated by graphene’s impermeability as a membrane. It is able to filter particles so fine that it can separate at the subatomic level (Radha, et al., 2016), which is highly applicable in filtration techniques. 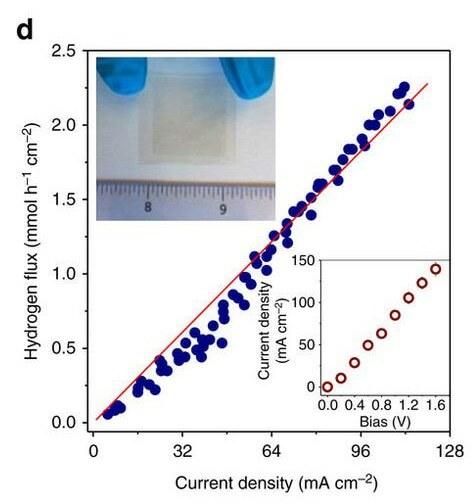 Their proposed method involved graphene (rGO) hydrogel due to its porous network structure and mechanical stability, thereby allowing for the filtration of U(VI) from aqueous solution (figure 3). The method was found to be quite effective, with their kinetics experiments showing significant absorption over time, albeit with further development required in order to reach higher adsorptions (figure 4). Furthermore, their findings fit very well with theoretical models of the adsorption. 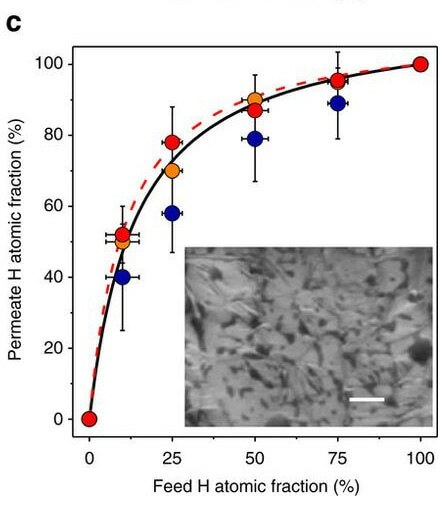 Additionally, they also found significant potential in the reusability of the medium, showing strong potential in using graphene hydrogel repeatedly to filter U(VI) in aqueous solution, maintaining its structure after repeated uses as well as keeping its adsorption ability after repeated filtrations. These findings all indicate strong potential in applying graphene to filter nuclear wastewater. Overall, the new technology of graphene has promising potential in applications in the nuclear industry at every stage, from the production of heavy water for the reactors, to the filtration of radioactive wastewater at the end of the fuel cycle. With such radical new applications, graphene will pave the way for innovations in the field as well as beyond. Achtyl, J. L., Unocic, R. R., Xu, L., Cai, Y., Raju, M., Zhang, W., . . . Geiger, F. (2015). Aqueous proton transfer across single-layer graphene. Nature Communications, 6539. He, Y.-R., Li, S.-C., Li, X.-L., Yang, Y., Tang, A.-M., Du, L., . . . Chen, H.-B. (2018, 1 8). Graphene (rGO) hydrogel: A promising material for facile removal of uranium from aqueous solution. Chemical Engineering Journal, 338, 333--340. Lozada-Hidalgo, M., Zhang, S., Hu, S., Esfandiar, A., Grigorieva, I. V., & Geim, A. K. (2015). Scalable and efficient separation of hydrogen isotopes using graphene-based electrochemical pumping . Nature Communications, 15215. Radha, B., Esfandiar, A., Wang, F. C., Rooney, A. P., Gopinadhan, K., Keerthi, A., . . . Geim, A. K. (2016). Molecular transport through capillaries made with atomic-scale precision . Nature, 222--225.